← Chick-O-Stick … Where have you been all of my life? Nestle Crunch Crisp..as Dionne Warwick would say…Walk on By! Ok, sometimes you don’t find winners at the Dollar General and this is one of those times. It’s 3 p.m. and I’m craving chocolate, but I have no plans to finish this thing. Bite into it, and you’ll find it has a fake-chocolate taste to start, and the crisps on top of the bar are very unappetizing. I’m fond of so many Nestle products, but this isn’t one of them. 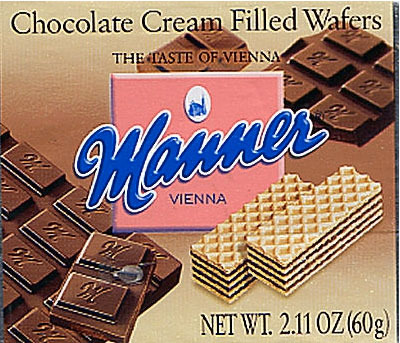 If you want a good “Crisp” candy bar, reach for the Manner Wafer Cookies. They have much more crunch and the fillings are excellent. Posted in Cookies, Don't bother, Milk chocolate. Bookmark the permalink.